New Question looks like it will be the Swedish retailer's next release. Stockholm-based retailer Sneakersnstuff has been on fire with Reebok Classics collaborations this year. In fact, they have a drop planned for every month, last releasing the "Legal Issues" Pump Fury in April. If you were curious about what this month's release would be, you may have gotten your answer if you tuned in to yesterday's episode of 106 & Park. 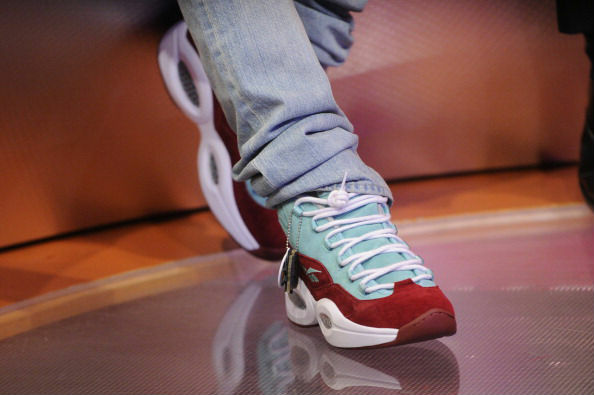 With Classics Creative Director Swizz Beatz in the house, host Bow Wow laced up an all-new colorway of Allen Iverson's Reebok Question. The suede-constructed shoe features a teal upper, dark red overlay, white Hexalite cushioned midsole and red outsole. Sneakersnstuff tagging gives the collaboration away, and the green section being filled in likely means it's the May release. This would mark the second Reebok Question collaboration of the year for Sneakersnstuff after releasing the popular "Crocus" back in March. No confirmation from Sneakersnstuff at the moment, but we'll update you when/if they make the announcement. In the meantime, check out these shots from today's show and let us know what you think of the new colorway.